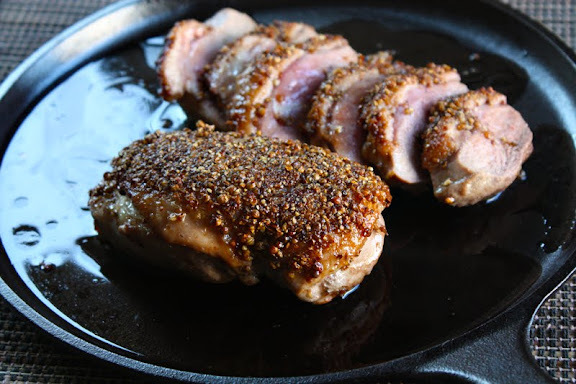 Coriander-pepper crusted duck breasts by She Simmers are made by puncturing the meat sides of two duck breasts (~ 8 ounces each) with the tines of a fork and rub them with 1 tablespoon fish sauce and 1 tablespoon brown sugar. A mixture of 1 tablespoon coarsely-crushed coriander seeds and 1 tablespoon of coarsely-crushed black or white peppercorns is pressed onto the skin. The breasts are then seared, skin side first, in a dry skillet over medium-high heat just to brown the outsides. The duck breasts are finished in a 400F oven.